Republican presidential candidate Carly Fiorina has a very long history of comparing herself to and talking about Steve Jobs. 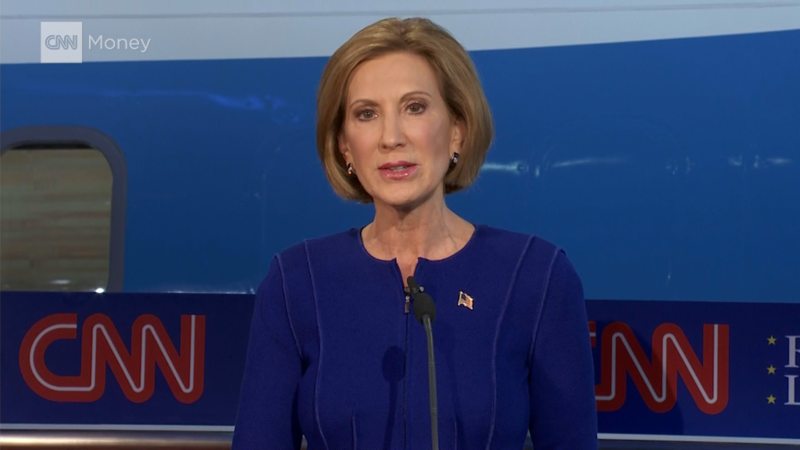 During Wednesday's debate, hosted by CNN, Fiorina said that Steve Jobs had called her on the day she was fired as CEO of Hewlett-Packard (HPQ). "Hey, been there, done that -- twice," Jobs said, according to Fiorina. It's hardly the first time she referenced that story. In an interview with Bizwomen in February, Fiorina said that Jobs gave her the "best career advice" she ever got after she was fired: "Do nothing for six months so you really know what you want to do." An Apple spokesman could not be reached for comment to confirm the story. In 2011, after Jobs stepped down from his CEO role at Apple for health reasons, Fiorina told Fox News that "Steve has been a good friend of mine." Though HP and Apple (AAPL) were rivals during Fiorina's tenure as CEO, Fiorina and Jobs did do a rather strange business deal in 2004: Apple agreed to sell iPods through HP's sizable distribution channels, marketed as the "Apple iPod+HP." It helped the iPod get sold at Walmart (WMT) for the first time. The MP3 player worked just like a regular iPod, but it had HP's logo on the back. As part of the deal, HP pre-installed iTunes on all of its Pavillion and Compaq Presario PCs. After poor sales, HP ended its distribution deal with Apple in July 2005 (after Fiorina had been fired).